There are simple steps we can take to protect our digital lives. NOVA has teamed up with cybersecurity experts to create the Cybersecurity Lab, a game in which players will discover how they can keep their digital lives safe and develop an understanding of cyber threats and defenses. Players will advance by using computer coding, logical reasoning, critical thinking, and vulnerability detection to solve various problems. These are the same skills employed regularly by cybersecurity professionals. However, players won’t need any prior cybersecurity or coding expertise to succeed. In the game, players work for a start-up social network company that is the target of increasingly sophisticated cyber attacks. Working alongside their friend and colleague—a brilliant, business-savvy entrepreneur—their goal is to grow their tiny company into a global empire. To do this, players must complete challenges to strengthen their cyber defenses and thwart their attackers. There are four major gameplay components: a coding challenge, a password challenge, a social engineering challenge, and a series of cyber battles. This challenge is an introduction to basic computer programming. Computer code is usually written in text, but in this challenge we’re using Blockly, a visual computer programming editor created by Google that uses drag-and-drop blocks that can be stacked together to create a computer program. 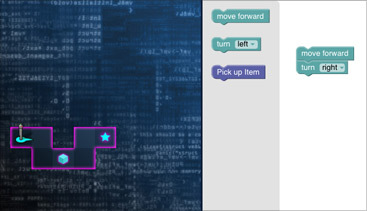 Players will program a robot to navigate a maze using Blockly drag-and-drop commands. Players will program a robot to navigate a maze using drag-and-drop commands. A Password is the most common way people prove their identities online, so using a strong password is essential for keeping digital information safe. In this challenge, players face a series of “password duels” that teach the basics of how attackers might try to crack their passwords and how they can create passwords that are more secure. Scammers try to trick people into handing over sensitive information and downloading computer viruses from emails. In this challenge, players will learn to spot scam emails, websites and phone calls. They will complete the challenge armed with practical tips that will help them avoid becoming victims of social engineering scams. 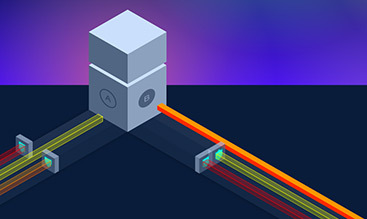 By completing the challenges, players will earn resources to buy cyber defenses to protect their companies against a series of cyber attacks that reflect the types of attack that real companies and institutions often fall victim to. Players will learn about a range of cyber attacks and how to effectively defend institutions from them. The Lab also features stories of real-world cyber attacks, a glossary of cyber terms, short animated videos, and video quizzes. The videos explain the need for cybersecurity; privacy versus security; cryptography (cyber codes); and what exactly hackers are. There is a broad range of jobs in the field of cybersecurity and a severe shortage of people with the specialized skills required to do them. As our lives become ever more intertwined with the Internet, the opportunities in this field will expand further. NOVA’s Cybersecurity Lab is a starting point to inspire a new generation of cyber defenders. I work to build solutions that help people and businesses manage and secure their personally identifiable information (PII). Empowering a digital society to use the Internet safely.